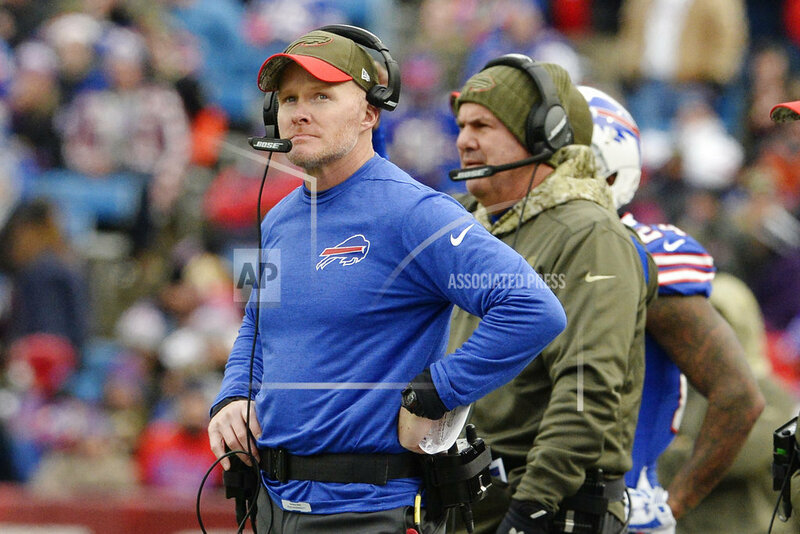 ORCHARD PARK, N.Y. (AP) — Sean McDermott’s faith in the Buffalo Bills hasn’t wavered despite the team’s latest dud. Unhappy as the first-year coach might have been Monday rehashing what’s gone wrong with a suddenly porous defense and sputtering offense, McDermott wanted to first remind everyone that the Bills (5-4) still have a winning record. “My mood is disappointed, but I’m upbeat,” McDermott said. Neither did the Bills four losses, including their most recent back-to-back meltdowns which have had the appearance of exposing a patchwork team for its various deficiencies. Their defense is suddenly springing leaks since defensive tackle Marcell Dareus was traded to Jacksonville three weeks ago. After allowing 194 yards rushing in a 34-21 loss at the New York Jets on Nov. 2, Buffalo surrendered 298 yards rushing — including a franchise-worst six touchdowns rushing — against the Saints. The defense was so ineffective that New Orleans never punted, scored on eight of its nine possessions (not including two that ended each half) and finished with a near 23-minute edge in time of possession. Buffalo’s offense wasn’t much better against New Orleans despite the presence of receiver Kelvin Benjamin, who made his debut since being acquired in a trade with Carolina on Oct. 31. Quarterback Tyrod Taylor produced just four first downs and 104 net yards through 55 minutes before being yanked in favor of rookie backup Nathan Peterman. Though the Bills currently hold down the AFC’s sixth and final playoff spot, they face a daunting stretch in their latest bid to end a 17-year playoff drought — the longest active streak in North America’s four professional sports leagues. After playing at the Los Angeles Chargers (3-6) on Sunday, Buffalo then plays at AFC West-leading Kansas City before returning home to face AFC East-leading New England on Dec. 3. McDermott referred to the struggles as examples of growing pains teams go through following an offseason overhaul. Aside from bringing in a new coaching staff and front office, headed by general manager Brandon Beane, the Bills purged much of their roster in opening the season with just 24 holdovers from last season. And that was before Dareus was traded on Oct. 27. McDermott refused to blame the run-stopping struggles on the loss of one player by saying the Bills were effective when Dareus played a limited role or missed a game because of injury. The numbers, however, suggest the opposite. In five games Dareus played, the Bills allowed 398 yards rushing, as compared to 657 in four games without him. Defensive coordinator Leslie Frazier couldn’t explain exactly what’s gone wrong when asked if Dareus’ departure was a factor. “Just two weeks ago, we were third in the league in run defense and boy, we’ve really fallen off the cliff,” Frazier said. Offensive coordinator Rick Dennison has headaches of his own to deal with in addressing a pedestrian LeSean McCoy-led running attack that has combined for 132 yards in its past two games. Unable to sleep after the loss to the Saints, Dennison said he called offensive line coach Juan Castillo to focus on plays the Bills do best.